The IGBT and thyristor were developed to take the advantage of the short switching time and low switching loss of the MOSFET, the high breakdown voltage, and low conduction losses of the BJT, in order to fulfill the demands of the current electric system. The demand to upgrade the aging power infrastructure in developed geographical regions, growth in the establishment of offshore wind farms, and the government initiatives to establish HVDC grid play a crucial part in the growth of IGBT and thyristor market. The IGBT market is expected to reach $8,256.3 Million by 2020 at a CAGR of 9.5% from 2015 to 2020; whereas, the thyristor market is expected to reach $3,632.0 Million by 2020 at a CAGR of 7.9% from 2015 to 2020. The opportunities such as increasing demand from consumer electronics sector, growing demand for deployment of low carbon emission power system, replacement of MOSFET’s with IGBT in EVs/HEVs, and deployment of smart grid will boost the IGBT and thyristor market in the near future. The report provides the profiles of the major active companies in the IGBT and thyristor market. The recent developments, contracts received by the OEMs, and the agreements to strengthen the growth of this market are also briefly discussed. The report provides the competitive landscape of the key players, which indicates their growth strategies in terms of the IGBT and thyristor market. The IGBT market segmented on the basis of packaging type which includes discrete and module market. By the power rating segment, the IGBT market segmentation includes high, medium, and low power IGBTs. Finally, by application, the market is segmented into power, renewable energy, rail traction, UPS, EV/HEV, motor drive, consumer electronics, and others. The thyristor market is segmented on the basis of applications, which include power, motor control, light dimmer, pressure control system, liquid level regulator, and others. The IGBT and thyristor market is also segmented on the basis of region, and is divided into four major regions, including the Americas, Europe, Asia-Pacific (APAC), and the Rest of the World (RoW). Major players in this market include ABB Ltd. (Switzerland), Danfoss A/S (Denmark), Fairchild Semiconductor International, Inc. (U.S.), Fuji Electric Co. Ltd. (Japan), Hitachi Ltd. (Japan), Infineon Technologies AG (Germany), Mitsubishi Electric Corp. (Japan), Renesas Electronics Corp. (Japan), SEMIKRON International GmbH (Germany), Toshiba Corp. (Japan) among others. The electric power is an essential part of modern society and the absence of power supply would have devastating repercussions on human life. The transmission system is loaded up to their limits and the power trading with varying load patterns can contribute to an increasing congestion in urban cities. The IGBT and thyristor were developed to take the advantage of the short switching time and the low switching loss of the Metal-Oxide-Semiconductor Field-Effect Transistor (MOSFET) and the high breakdown voltage, and low conduction losses of the BJT, in order to fulfil the demands of the current electric system. The factors driving the growth of the IGBT and thyristor market include the demand to upgrade the aging power infrastructure in the developed geographical regions, growth in the establishment of offshore wind farm, and the government initiatives to establish HVDC grid. On the other hand, the factors restraining the market’s growth are economic uncertainties, high infrastructure deployment cost, and unawareness regarding the benefits of FACTS. However, short term opportunities such as increasing demand from consumer electronics sector, growing demand for deployment of low carbon emission power system, and the deployment of smart grid will boost the IGBT and thyristor market in the near future. While, replacement of MOSFET’s with IGBT in EVs/HEVs would be a captivating for the existing as well as new entrants. 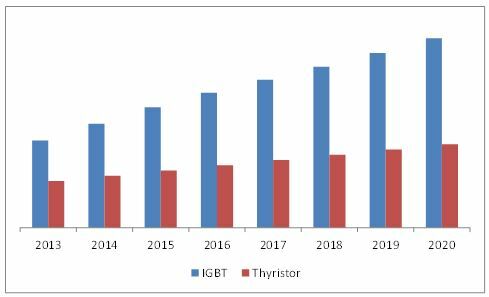 The market size of the IGBT market is expected to grow at a CAGR of 9.5% from 2015 to 2020; whereas, the market size of the thyristor market is expected to grow at a CAGR of 7.9% from 2015 to 2020. This report focuses on detailed segmentations of the market, combined with qualitative and quantitative analyses of each and every aspect of the classification on the basis of packaging type, power rating, application, and region. All the numbers, at each level of detail, are forecasted till 2020 to give a glimpse of the potential market size in terms of value in this market. Major players in the IGBT and thyristor market include ABB Ltd. (Switzerland), Danfoss A/S (Denmark), Fairchild Semiconductor International, Inc. (U.S.), Fuji Electric Co. Ltd. (Japan), Hitachi Ltd. (Japan), Infineon Technologies AG (Germany), Mitsubishi Electric Corp. (Japan), Renesas Electronics Corp. (Japan), SEMIKRON International GmbH (Germany), and Toshiba Corp. (Japan) among others. 11.4 Fuji Electric Co., Ltd.
11.5 Fairchild Semiconductor International, Inc.